MANILA, Philippines -- The flight crew of a Saudi Arabian Airlines plane mistakenly pressed a hijack warning button twice as it approached Manila’s airport on Tuesday, causing airport officials to mobilize security forces and isolate the jet after it landed, Philippine officials said. Manila airport manager Eddie Monreal said Flight SV872 from Jiddah made the distress call about 20 miles from the airport. Airport authorities asked for a verification of the emergency message and the flight crew confirmed the distress call, he said. It was not immediately clear how the confirmation was made, but internationally known emergency codes were used by both the flight crew and control tower, Monreal said. However, the captain later told the control tower that a button indicating a hijacking was in progress had been pushed accidentally. Despite the assurance, airport authorities quickly convened a crisis committee, Monreal said. 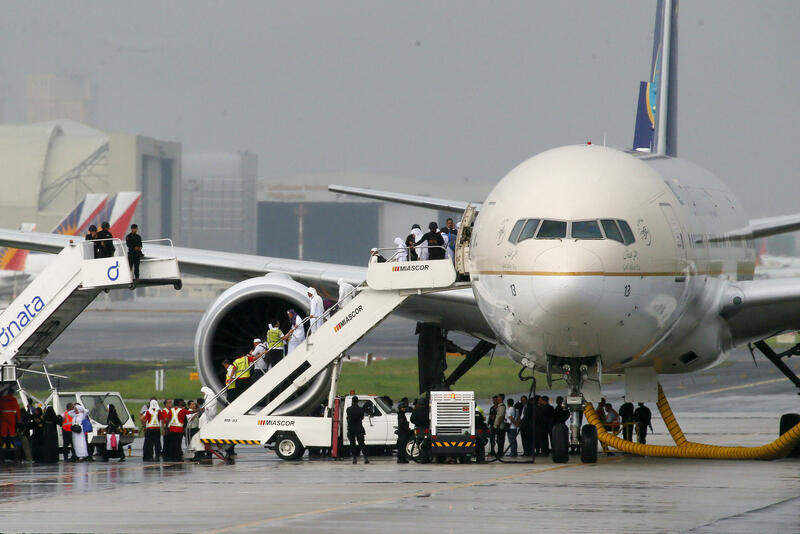 The Boeing 777 was isolated after it landed and security personnel were deployed as a precaution. The passengers were later allowed to disembark and told reporters that everything had been normal in the cabin until relatives informed them by cellphone about reports that the aircraft may have been hijacked. Some of those coming off the plane were dressed in white, likely indicating that they were returning from the annual hajj pilgrimage, a ritual required of all able-bodied Muslims once in a lifetime. Saudi Arabian Airlines, also known as Saudia, does brisk business during the hajj, which reached its climax last week. The 71-year-old airline, which operates 119 planes, said on its official Twitter feed later Tuesday that there was a false alarm of a hijacking aboard the flight. Monreal said the plane was carrying 410 passengers and 21 crew members. The Civil Aviation Authority of the Philippines said it is investigating the cause of the incident. “Appropriate penalties and sanctions will be imposed on the erring pilot if the result is indeed a human error,” it said in a statement. The incident came after Philippine officials in February announced they had strengthened security for Saudi Arabia’s embassy in Manila and its national airline because of a possible threat. At the time, officials also said additional armed officers were posted in the boarding area for the Saudi flag carrier and to guard the airline’s luggage. It did not elaborate on the threat. However, it came as the Sunni-ruled kingdom has been on increasingly hostile terms with Shiite power Iran.